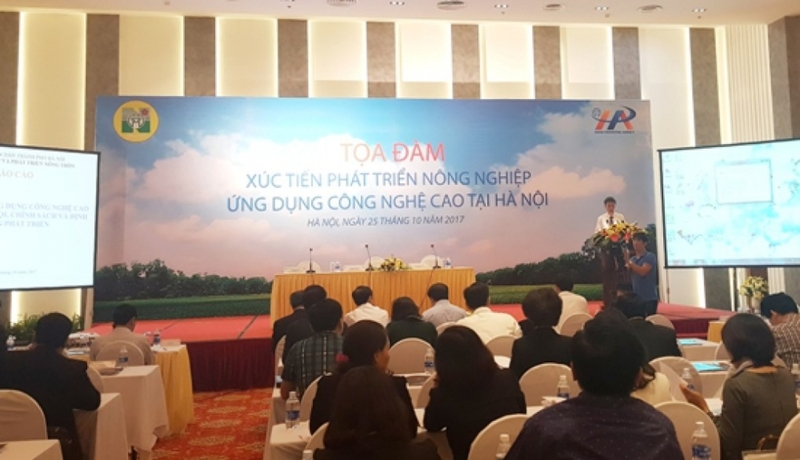 A workshop was held in Hanoi last week to introduce businesses to the city’s preferential policies for the agricultural sector, especially hi-tech agriculture, in order to promote investment in hi-tech agriculture in the capital. Nguyen Thi Thoa, head of the Plantation Division under the municipal Department of Agriculture and Rural Development, said that Hanoi has no zones dedicated to hi-tech agricultural production. The value of hi-tech agricultural products accounts for only 25 percent of the total value of agricultural products. The city aims to raise the proportion to 35 percent in the future, Thoa stated, adding that it is building a 96.6ha hi-tech agricultural zone in Dong Anh district and is taking measures to increase the application of advanced technologies in agricultural production. Director of the Information Center for Agriculture and Rural Development Nguyen Anh Phong introduced participants to preferential policies which encourage enterprises to invest in hi-tech agriculture, as well as criteria to define hi-tech agricultural products. At the workshop, participating businesses proposed the State provide land support policies as there is a lack of large land lots for them to develop concentrated production areas. They also said they hope to receive assistance in infrastructure, taxation and credit.